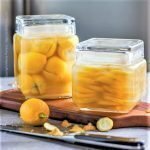 Step by step tutorial on how to make preserved lemons (aka pickled lemons) PLUS a detailed section with many ideas on preserved lemons uses. Preserved lemons have multiple culinary uses and impart intense, bright flavor. What Are Preserved Lemons and What Do They Taste Like? Preserved lemons are simply fresh fruit cured in salt and lemon juice. Yet, they are flavor bombs of epic proportions. They are part of the culinary traditions of the Northern Africa Mediterranean coast, the Middle East, India and South Asia. In result of the curing process their characteristic tartness is significantly subdued while the lemon flavor becomes pronouncedly intense. The rind loses its bitterness. If it is your first time tasting a preserved lemon you will be impressed by the distinctive, pure lemon essence and amplified aroma. In fact, you might have trouble believing that the lemon flavor can be so potent (in the best of ways!). In summary, as compared to fresh ones preserved lemons have a bolder lemon aroma, much lower acidity and a salty tang. 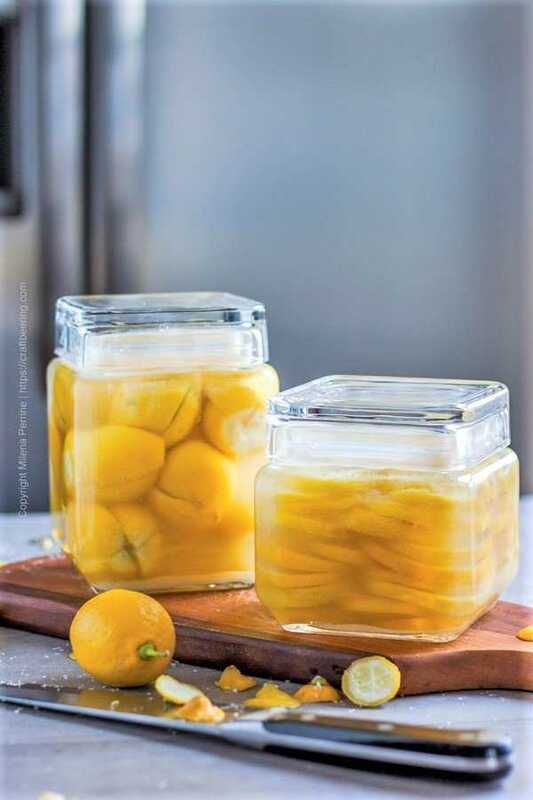 Jump to Recipes Using Preserved Lemons and Preserved Lemons Uses or keep reading to learn how easy they are to make. Preserved lemons are very simple to make and require a single ingredient besides the lemons themselves. YOU WILL NEED: as many lemons as you’d like to preserve plus a few extra for the juice and salt. Equipment wise – a sharp knife, a cutting board and wide mouth jars with air tight lids. As a rule of thumb budget about a tablespoon of salt per lemon plus a bit extra for the bottom and top of the jar. Salt inhibits the growth of food borne pathogens found on the surface of the lemons and eliminates them, hence preserving the fruit. Through osmosis salt helps draw out water from the lemon cells and simultaneously inserts salt into them. Bacteria, yeasts and molds cannot survive in the environment with reduced free water molecules. PROCESS: All you have to do is clean, cut and salt the lemons, then pack them into jars along with freshly squeezed lemon juice. The rest amounts to patiently waiting for the curing process to take place. There are two prevalent ways to cut the lemons – you can quarter them or slice them into circles. For this post I used smaller, thinner skinned lemons to quarter and larger ones with thicker rinds to preserve sliced. Below are quick step by step image collages for each method. 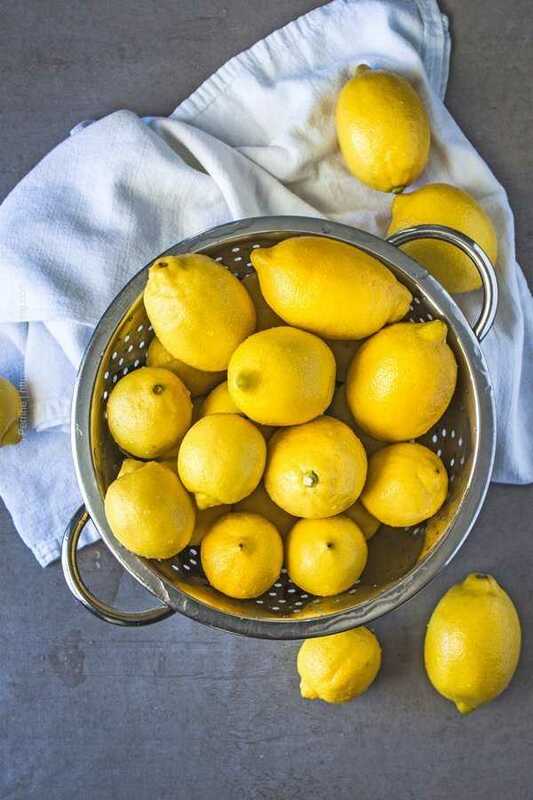 Begin by cleaning the lemons – simply scrub the skins under running cold water. Be sure to remove any waxy coating from store bought ones (unless you have a lemon tree in your back yard you are very likely to deal with waxed fruit). Begin by cutting off the ends tips of each lemon then stand them up vertically as shown below. Cut down in half almost to the bottom, then across to create quarters attached at the base. 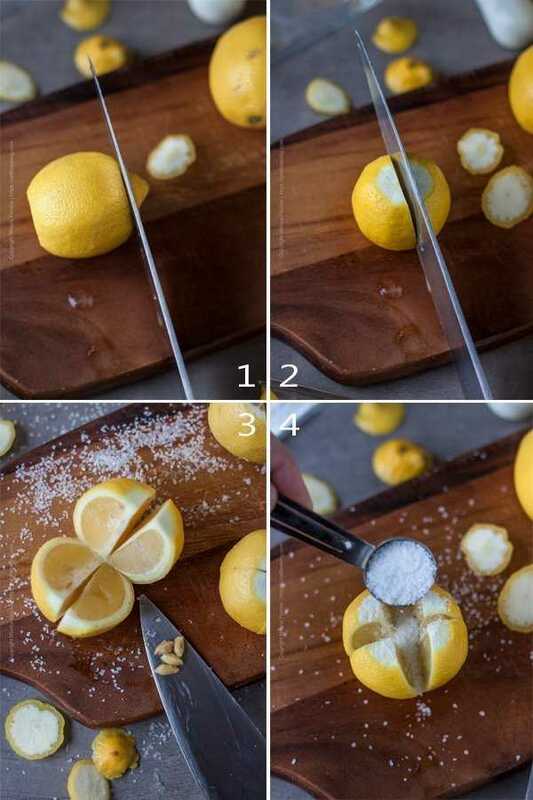 (This traditional way of cutting the lemons goes back many centuries). Gently separate the quartered fruit and remove the seeds, then fill with salt as shown. Once all your lemons are generously salted pack them into a jar (bottom lined with salt) as tightly as you can (#1 and #2 below). While doing so also sprinkle salt around the sides. Pressing onto the lemons will release some juice. Finish by topping with more lemon juice to completely cover the fruit, close the jar with a lid and let sit at room temperature – cooler is better. 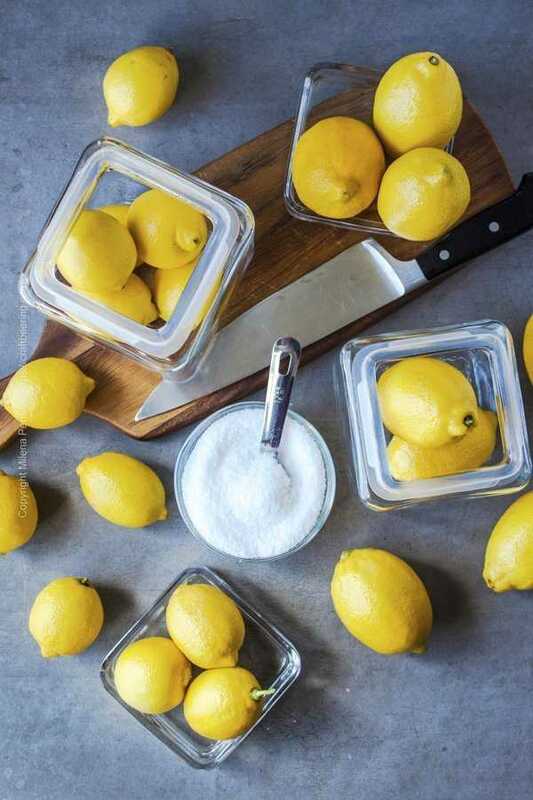 TIP: Regardless of how you cut the lemons it is helpful to gently shake the sealed jar every day while they are pickling to redistribute the salt. If the lemon juice level drops to where it does not cover the lemons completely, add a bit extra juice or some filtered water. Cut off and reserve the ends – to squeeze out any juice later, then slice into circles. 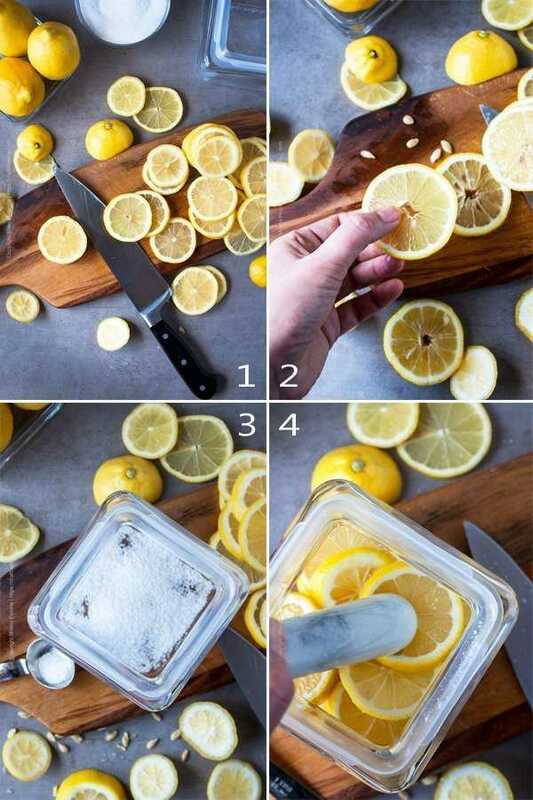 Remove the seeds (helpful, so you don’t have to deal with them later #2), cover the bottom of a sterilized jar with salt (as shown below) and begin stacking lemon slices, occasionally pressing onto them to release the juice (#4, you can use a pestle or your fingers). Next add salt between layers and repeat the process (#1, #2 and #3 below). Finally, squeeze out the juice from the reserved ends and top with extra lemon juice if needed (#4 below). TIP: If you run out of lemon juice top with filtered cold water until you have enough liquid to cover the lemons fully. Just packed jar of sliced lemons, salt and lemon juice. Left to cure at (cooler) room temperature they will transform into pickled lemons. Salt Preserved Lemons – What Salt to Choose? The best type of salt to use is coarse, granular sea salt such as sel gris. Industrially produced Kosher salt is commonly used today and you will get good results with it. Avoid iodized table salt at all cost. Even though Chris and I are preserved lemons purists and like them for exactly how they taste we appreciate the addition of other ingredients. From various peppercorns or juniper berries to red chili flakes and mustard seed and even hops infused salt – there are many potential ingredients that can contribute a compatible flavor to the lemons. Indian spices include turmeric and fenugreek. Sometimes Chris adds sugar (also a great preservative) to the salt in which case the result is a more balanced residual flavor. Especially if you preserve blood oranges instead of lemons and add sugar. You can also use limes. For example in Vietnam limes/key limes are commonly preserved, called Chanh muối. They are the main ingredient of the wildly popular salty lemonade known nước chanh muối (with sugar and soda water added to the preserved limes). I love the flavor of salty lemonade and used to get it every time I visited Ho Chi Minh city for work. Such a treat! 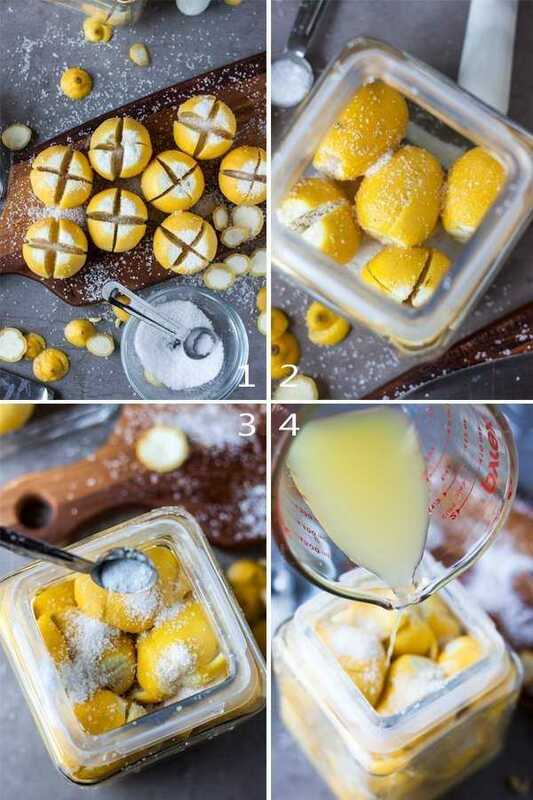 The curing of salt preserved lemons takes between 3 to 4 weeks. Sliced ones are ready a bit earlier than the quartered ones as there is more exposed surface area in contact with the salt. The more lemons packed in a jar, the longer the curing process will take. Over time the thick skin will start to turn translucent and the color will fade. When this happens and the rinds become soft, the preserved lemons are ready to use. The rinds of preserved lemons are soft, translucent and have a faint yellow color. 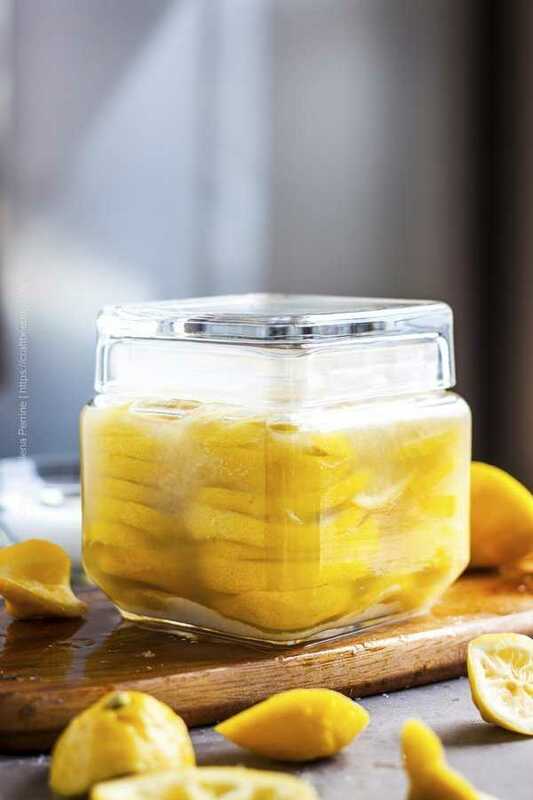 Your pickled lemons can keep for months – up to a year and even longer, especially if you refrigerate them. After all, their beginnings are in keeping fresh fruit for use after its peak season. 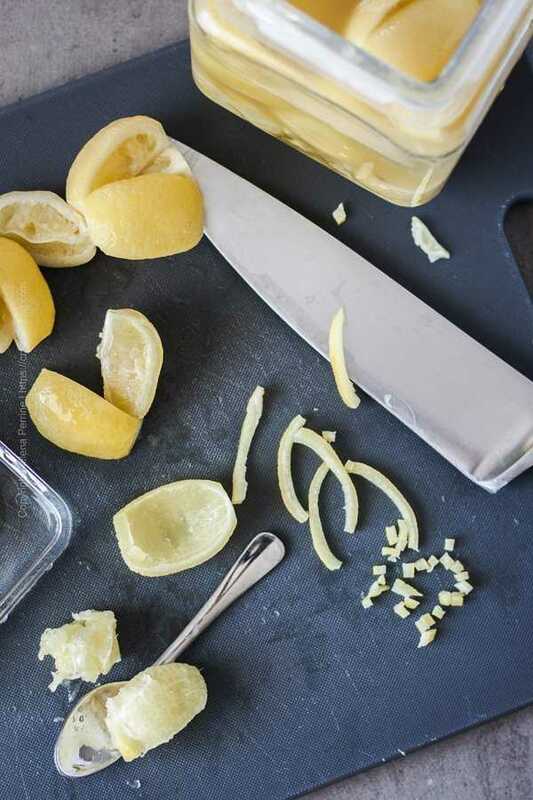 After salt and time have worked their magic there are a couple of easy steps you need to complete to prepare the preserved lemons each time you want to use them in recipes. Half a lemon goes a long way! First rinse them thoroughly with cold water. Use a small spoon or a butter knife to scrape off the pulp and separate it from the rind. Do not feel obligated to discard the pulp – consider using it (ideas below). That being said – the soft, very fragrant rind of the preserved lemons is where it is really at! You can thinly slice, dice or mince the rind and add it to hundreds and hundreds of dishes to impart lemon essence, faint acidity, saltiness and deep umami. Finally, the preserving liquid itself can be used – sprinkle it over fish or chicken before baking it or add it to salad dressings, fish stews etc. Be sure to review our detailed list of recipes and ideas on How to Use Preserved Lemons as an Ingredient under the recipe card. Preserved lemons are used as a condiment and recipe ingredient to impart fresh, potent lemon flavor with very mild acidity and salty tang. Recipe to make them at home and a comprehensive list of ideas on how to use them. Under running cold water clean the lemons by thoroughly scrubbing the skins. Be sure to remove any wax. Cut off the end tips and either slice the lemons in circles (better for larger fruit) OR quarter them vertically, leaving the ends attached on one side (better for smaller fruit). To the bottom of a jar add salt. 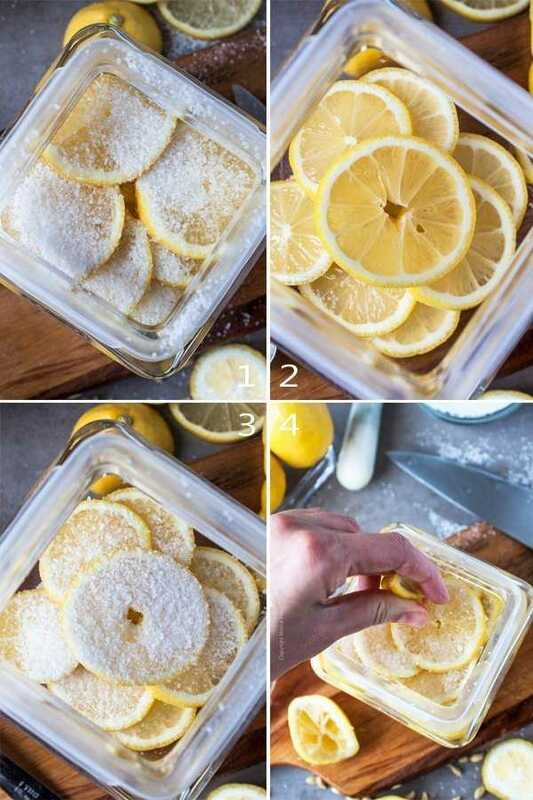 Either pack the lemon slices alternating arranged layers of lemons and salt and pressing onto them as you go to release juice OR slightly open up the quartered fruit, fill with salt generously and pack as tight as you can in a jar, adding a bit more salt around them as you go. Fill the packed jar(s) with lemon juice** making sure that all the lemons are fully covered. Leave to cure in a cool place/lower room temperature for about 3 to 4 weeks. Give the jar(s) a shake now and then to redistribute the salt. Add more lemon juice if levels drop and fruit becomes exposed. Rinse thoroughly before using in recipes. Consult How to Use Preserved Lemons (Prep Steps) above and Recipes Using Preserved Lemons and Preserved Lemons Uses below for tips and ideas. *Budget about 1 tbsp of salt per small lemon (or lime). Increase accordingly for larger fruit. **If you run out of lemon juice you can add a bit of cold, filtered water to ensure the fruit is fully submerged. If not fully covered with liquid pieces of lemon can develop a coating of white mold during curing. This is harmless - simply wash it off, place the lemon back in the jar and top with more lemon juice. Once cured move the preserved lemons to the fridge, they will keep well for a year, even longer. The dish most people associate with preserved lemons is chicken tagine. However the scope of their uses is only limited by the imagination. Chris often says that anywhere a lemon can be used a preserved lemon could do a better job and I think that there is much truth in this assertion unless your main goal is acidity. Besides the traditional recipes of the world cuisines in which preserved lemons play a key role, I’ve rounded up below several ideas to show you how to add their essence, unique umami and depth to dishes. A few are from my childhood, others come from restaurants Chris has worked at and others are dishes we’ve made together in the past. 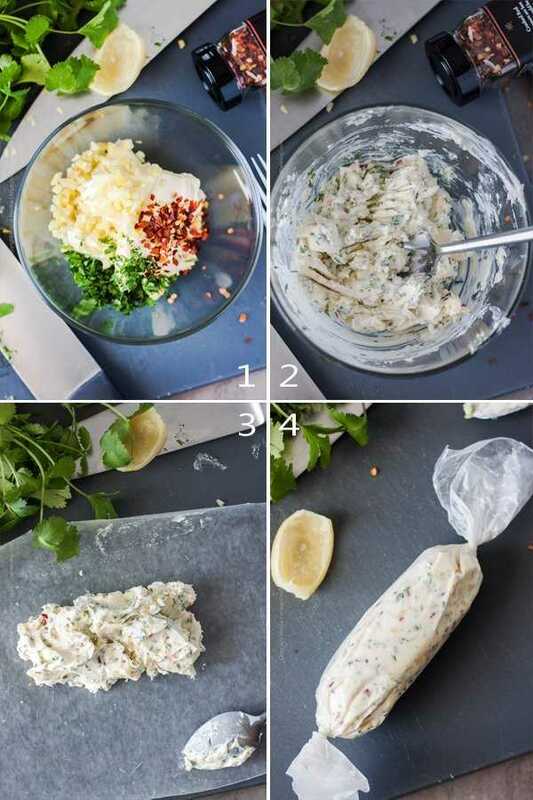 Let’s start with two extremely easy recipes – one for a compound butter and one for a delicious tapenade. In a bowl place all the ingredients – a stick of room temperature butter cut in pieces, 1 tablespoon minced preserved lemon rind, 1 tablespoon of chopped fresh cilantro and red pepper flakes to taste (start with 1/2 tsp). Mix well with a fork, transfer onto wax paper and roll into a cylinder shape, tightening by twisting the ends. Refrigerate and use as needed – cut slices of the butter and place onto baked potatoes, grilled fish or chicken breast, etc. 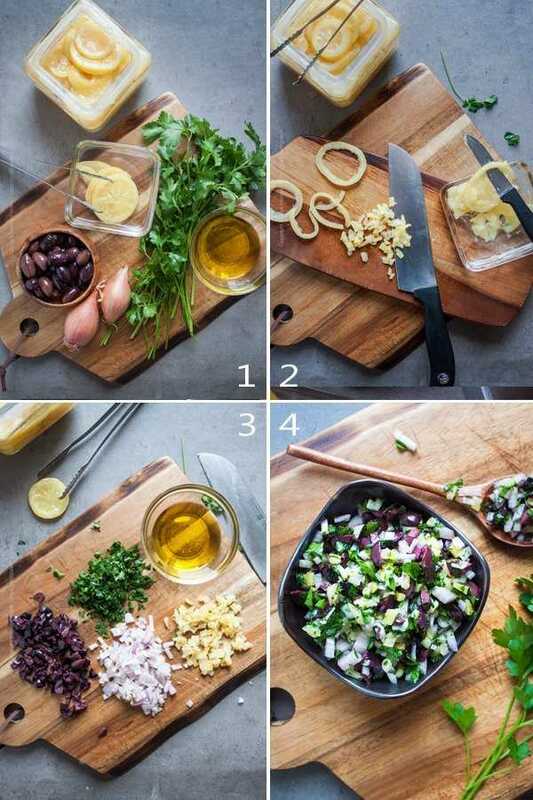 The ingredients are 2/3 cup kalamata olives (pitted and diced), 2 small shallots (diced), 2 tbsp flat leaf parsley (chopped), 2 tbsp of preserved lemon rind (diced) and about 1/4 cup extra virgin olive oil. Mix everything together and serve in any manner you would a regular tapenade. Thinly sliced preserved lemon rind makes a very, very fragrant twist you can use with various cocktails – try it! You can also add it to this Anchovies Pizza instead of thinly sliced lemon. Add it to home made aioli – use this recipe that takes a minute and we love to serve with Blistered Shishitos. Mix it with Dukkah spice and olive oil to use for bread dipping or to spread over freshly baked flat bread. Add it to hummus spreads, roasted chickpeas or into falafel mixture before you fry it. Sprinkle over grilled or roasted veggies – from asparagus and Brussels sprouts to green beans and yellow beets, etc. Add to grain bowls or salads – faro, quinoa, bulgur etc. Add to cooked legume salads – beans, lentils etc. 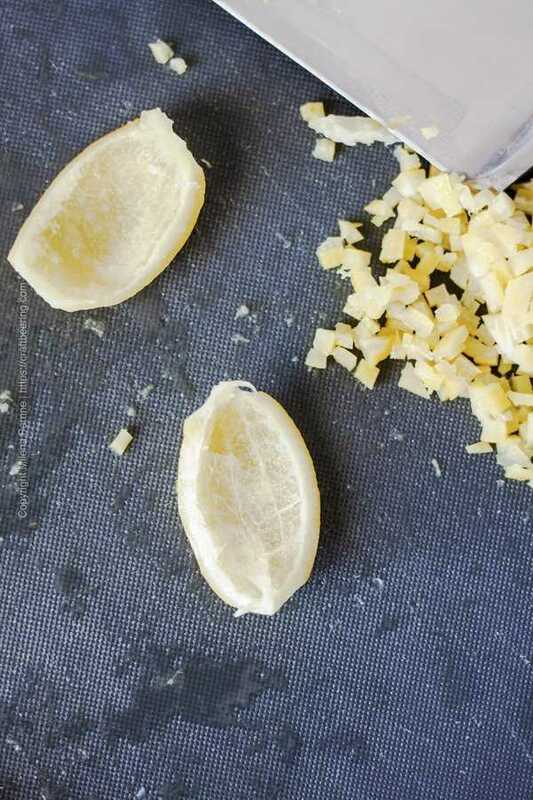 TIP: As a rule of thumb, first add the minced preserved lemon and then season with salt. Chances are that you won’t need extra salt. Even though the pulp of preserved lemons is customarily thrown away it can contribute flavor in a variety of ways. 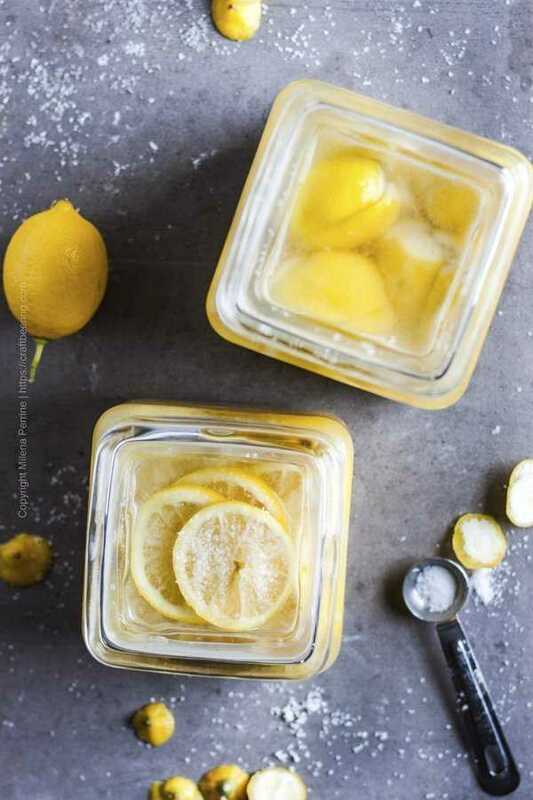 The preserving liquid can save for months after the lemons have been used up. It’s rich flavors can also be leveraged. FINAL TIP: Preserved lemons are not just for savory recipes. Try minced lemons sprinkled over strawberry sorbet or incorporate them into various frostings. You can also mix that salty lemonade – muddle a wedge of salted lemon with a tablespoon of sugar and fill glass with soda water. If you’d like to remove the saltiness before you use preserved lemons with sweet recipes – rinse them in cold water then blanche for 10 seconds in boiling water. Flavor bomb indeed! Your photos are so bright and beautiful!! Preserved lemons are on my foodie bucket-list. I’ve got to try your method soon! Flavor bomb is such an accurate description! I’ve always wanted to make these! Thanks for the tutorial! I’ve never made preserved lemons before and I can’t wait to try. Thank you for the inspiration! 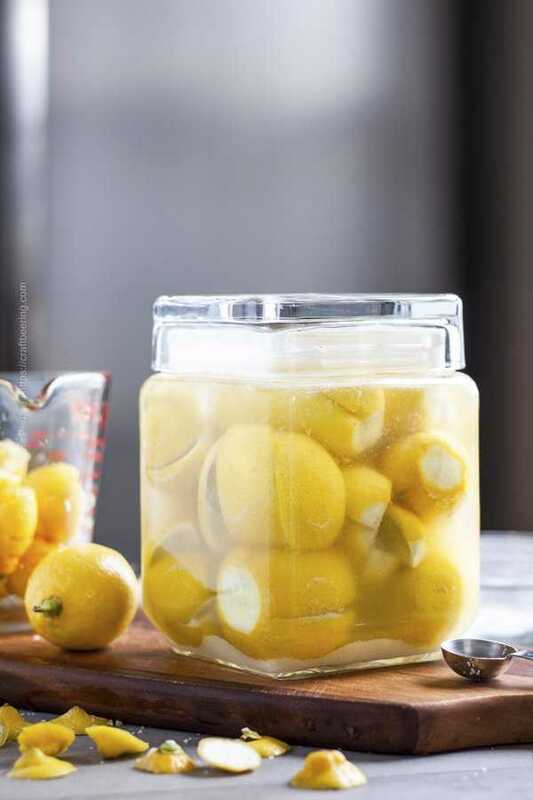 I have always wanted to make preserved lemons, so I love the step by step instructions here. So useful to have around for so many dishes!